Hallowell is blessed with wonderful collections of artifacts, photographs and architectural treasures. 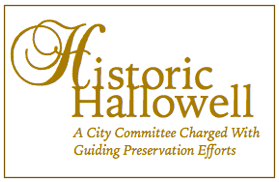 The Historic Hallowell Committee is compiling a listing of collections and how they can be accessed for research or personal interest. The Hubbard Library is the most readily accessible repository. Admission is free and a schedule of hours appears on its website. A visit to this Gothic style cathedral of learning allows a unique view into Hallowell history. Many items like paintings and historic artifacts are on display. The Library has an extensive collection of photographs from Old Hallowell, many of which are available online through the Maine Historical Society’s Maine Memory Network project Type “Hallowell photographs” in the Search box and you can peruse the more than 250 items that have been uploaded to the Network. You can take a closer look at any photograph by clicking on the “zoom” function in the capFtion beneath the picture. Many of the photographs in the Hubbard Library Collection were used in the Hallowell Maine Community Heritage Project website developed in partnership with HallDale Middle School students. The Hallowell Fire Department has an extensive collection of memorabilia which was cataloged as part of the Hallowell Maine Community Heritage Project. Work is being done to prepare an online exhibit of selected items from the collection. The City of Hallowell has municipal records available for research purposes. Contact the City Clerk for more information. The Vaughan Woods and Historic Homestead shares its vast collection through a changing display view able on the bookcase in the just inside the library doors. The Homestead is also open to the public during special events and Tuesdays in July and August by appointment. Check the website for more information. The Row House is a non-profit, membership organization dedicated to preserving Historic Hallowell, Maine. Row House has a great map that allows visitors to stroll the streets of Maine’s smallest city and feast on the architectural delights preserved in its historic district. Copies of the tour map are available at the Hubbard Library and Hallowell City Hall. There are also some wonderful historical Hallowell photographs in the collection of the Eastern Publishing Company, now under the care of the Penobscot Marine Museum.